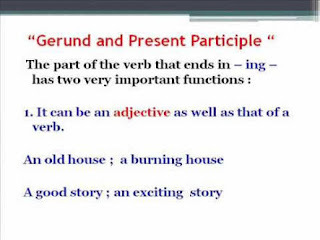 The Difference Between a Gerund and a Present Participle. Due to the numerous questions I got on this, I decided to write this article. 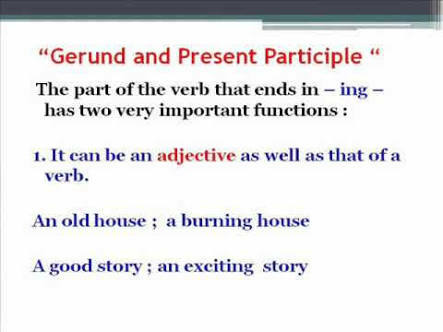 The first thing you should know is that both gerund and present participle are verbs. They are the -ing/continuous form of a verb, e.g. walking, running etc. However, not all 'ing' verbs are gerunds. What is a Present Participle? A present participle is an 'ing' verb that functions as a verb or as an adjective. In other words, when an 'ing' verb functions as either a verb or an adjective, it is called a present participle. o She is teaching the students the genres of literature. o Could you please tell me about your teaching experience. In sentence one, the 'ing' verb, 'teaching' is functioning as a verb whereas in sentence two, it is functioning as an adjective(that is, it is qualifying the noun, 'experience'). Therefore, 'teaching' can be called a present participle in both sentence one and two. On the other hand, a gerund is an 'ing' verb functioning as a noun in a given sentence. · Teaching is a good profession. In the above sentence, 'teaching' is functioning as a noun, so it is a gerund. In sentence one and two, 'running' is a present participle because it is functioning as a verb and an adjective respectively. In sentence three, 'running' is a gerund because it is functioning as a noun in the sentence. Other examples of 'ing' verbs that can be classified as present participle and gerund are: walking, praying, standing etc. In sum, a gerund is an 'ing' verb that functions as a noun whereas a present participle is an 'ing' verb that either functions as a verb or an adjective. It is also important to note that whereas all 'ing' verbs can be present participle, not all 'ing' verbs can be gerund. Thanks! You can download our android app on google play store. Search for 'Tammy's English Blog' and download to get more of this. Tammy Reuben Is A Graduate Of English And Literary Studies Whose Love For Teaching English As A Second Language And Providing Students With Useful Educational And Secular Information Resulted In The Creation Of This Blog.